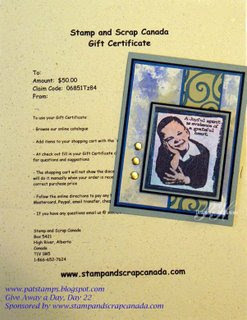 Today's giveaway for the Technique Junkie Newsletter Anniversary Celebration is a $50.00 gift certificate to Stamp and Scrap Canada! To enter the giveaway for today, leave a comment on Pat's blog entry letting her know that you would like to enter. Enter by 11:59pm EST on Tuesday, October 23, to be eligible to win!